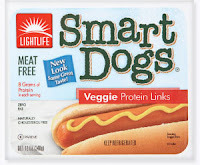 This week is the second attempt at Lightlife Smart Dogs. I didn't have high hopes for these, I'll be honest. They have been in my fridge since the first attempt, just waiting for me to give in to my journalistic integrity and give them a second shot. I promised you all I would, so here goes. In preparation for this, I made up some homemade coleslaw, and cooked some corn on the cob. I was ready to have a real, American cookout experience. With my Foreman grill. Too lazy for charcoal, sorry guys. Maybe next time I get my hands on some fake hot dogs. Since I microwaved these last time, I decided to try a couple different cooking techniques, keeping in mind that the goal is not to cook them, but merely to warm them. First, a pot of boiling water. Dropped a couple dogs in there to warm up. I also cooked a couple on the grill, next to some backup real-meat hot dogs (but not touching - the experiment is still valid!). I threw them all in buns and topped with ketchup (my only condiment of choice for hot dogs of any sort). Took a moment to center myself, while wondering what the hell I was doing, then took a big bite of the boiled dog. When I tried it before, it was a completely naked dog, no bun, no ketchup, and it was foul. With both bun and ketchup, it was slightly better. It tasted a little like barbecue sauce, but with a background flavor of... something else. Probably soy sauce. It was not terribly pleasant. And the texture... oh the texture. Super mushy. My mouth was not pleased. I think it may have taken on some of the water it was boiled in. This week, I'm checking out Morningstar Farms Asian Veggie Patties. These are not technically attempting to replace meat, but I figured it should still count. Plus it looked tasty. First off, the description on the box and website says, "A sweet and spicy veggie patty with hints of chilis, garlic, and ginger." My spice tolerance is very low, so that chili thing made me a teensy bit nervous, but the "hints of" part reassured me. I threw a couple patties on the ol' Foreman grill to heat them up and get them nice and crispy, tried to guess what sort of condiments would go with an Asian veggie patty, and ultimately decided to eat it naked. The patty was naked, I mean. I'm not here to talk about what I was wearing. Anyway, there was not much to say about the patty's appearance or smell. It sort of smelled like general freezer-smell, frankly, which makes sense, given that it came out of a freezer. So I dug in. Gotta tell you - it was spicier than the box indicated it would be. Not so much that I couldn't eat it, but it did make it so that I couldn't really taste anything else. Maybe that was good. I don't know. The biggest problem I ran into, since I couldn't taste it, was the texture. The first ingredient is carrots; the second is water chestnuts. I could definitely tell when each bite contained one or both of these. Man, I hate water chestnuts. They have such a gross texture. Maybe other people like them, but I'd just rather avoid them, if I can. Aside from the random vegetables, the patty was pretty lame, texturally. It was almost mushy, except for the edges, which were nicely crisp from the grill. All in all, this was a fairly unpleasant experience. I don't know what I plan to do with the other two patties in the box. Maybe I'll try one of the recipes that use them. I'll let you know.